Bangalore may not be known for its street food but it surely has its fair share of cafes. Here, cafes come with more character rather than a place offering just some scrumptious food. The outdoor seating and beautiful in-house plants sync with the moderate climate of Bangalore... With so many places out there and so many cafes opening every day, it is rather difficult to make a decision. 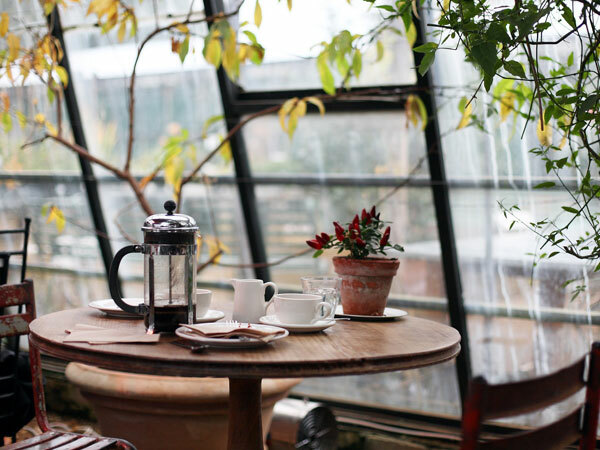 So here we are, picking the best cafes for you which have swooned our hearts and we are sure they'll swoon yours too. The places that we have picked are according to the vibe, the menu and the unique characteristics and we hope you enjoy visiting these places as much as we did. Housed on the first floor, this café is all about comfort and lazing. The narrow staircase leads you to a beautiful quaint place which looks like it has been handcrafted with love. They have a section dedicated to books, rustic brown tables and reused Nutella jars to serve sugar. From the paintings of African dancers playing the flute and the small placards that read different popular culture phrases, everything about this place lends it a character of its own. The food is yet again the most popular thing about this place. Especially, the juice of the day. It's an all-day breakfast place and you're offered a variety of breakfast portions: Continental, English, Italian, et al. Meal cost: Rs 600 for two. Just like A Hole Lotta Of Love, Yogisthaan Café has a character of its own. This very Indianised place offers everything organic. The vegetables used here are all home-grown. The vibe here is calm and composed just like the face of a yoga guru. You are not allowed to wear your footwear inside but who really cares when you get to walk bare feet on a floor that is made out of stone? This place also houses a corner for books. The crockery here is all brass and the menu is typically Indian, though you'll get organic yogurt and sandwiches; it is recommended that you order Indian food because that's their speciality. The food takes time because everything is cooked from scratch and they don't use any preservatives. The service is on point. The humble waiters treat you like a family member. The place also offers yoga classes. As we said, the place reflects the ideology of being organic and natural. Another place that boasts its Indian nature is Bombay Brasserie. From the outside, the place looks quite authentic and very Greek but as you step inside and look around the marvellous décor, you know that you've come to eat Indian food. The walls are decorated with names of places from all across the country. The furniture is quaint and is very old-school. The menu is what makes it a super place to have lunch or breakfast. From Delhi's famous chole bhature to a refreshing organic mint juice, this place is true value for money, even though it is a bit expensive. The place also features a swing table but that has to be reserved in prior since the footfall is high. Meal cost: Rs 1500 for two. Unlike the above three, this place falls on a rather contemporary side of décor. The wooden furniture and huge posters of old musicians give it a rather rustic appeal. The staff is uber friendly and the serving time is rather fast. The place has huge French window which houses a row of hop-on chairs. The view from the window overlooks the lazy street. The place boasts of its English menu. It has one of the best waffles and pancakes. If you have been dying to have a sweet breakfast, head on to Café Terra for some bites. The music here is not meant for everyone but if you're up for some groovy beats, you will like their playlist. In all, the place has its own quaint, very New York character and the food will surprise your taste buds. Meal cost: Rs 700 for two. If there is a place as lively and as charming as Watson's in Cooke Town, we will love to visit it too. Watson's has the perfect ambience, perfect music and perfect menu to please you then and there. Starting from the rooftop seating to beautiful wooden furniture to houseplants and beautiful yellow creepers that move aside your table, Watson's is the go-to place for every youngling in town. You can order a nice English breakfast here or enjoy a delightful full meal; Watson's offers a variety of delicacies. Sometimes it gets really hard to choose. Meal cost: Rs 1300 for two.